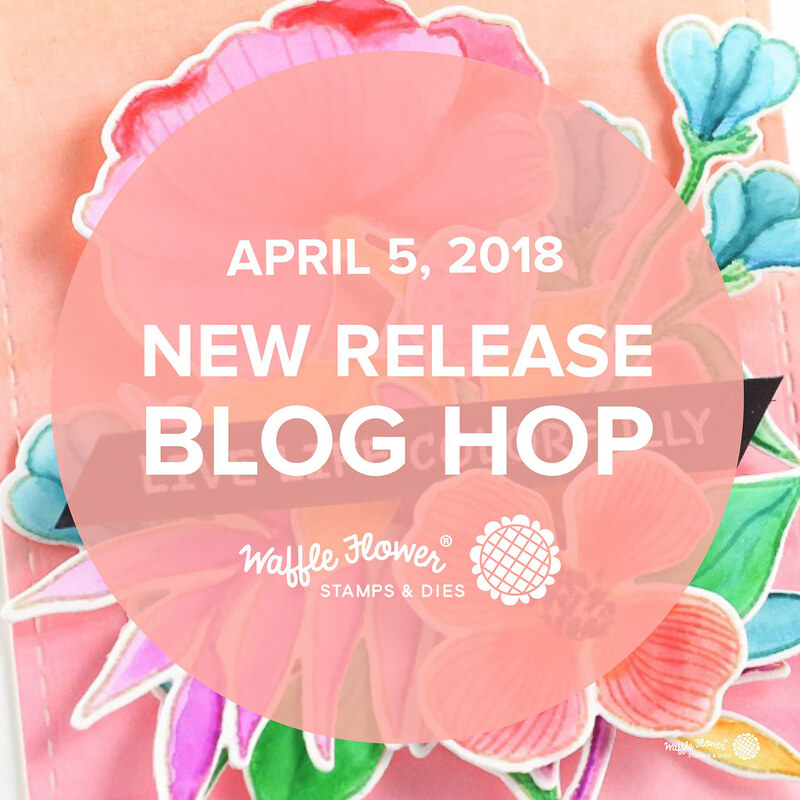 I'm super excited to be joining the blog hop for the Waffle Flower April Release! Waffle Flower is releasing 6 brand new stamp sets and 6 new die sets! They also have a new option where you can purchase the stamp and die combo pack! Plus, they have some really neat and fun new packaging! My first card uses the adorable new Therefore I Am stamp set and Coordinating dies. I stamped the images in waterproof black ink onto watercolor paper, and watercolored them with Distress inks. I cut the entire image out with the Lovely Layers largest scalloped die. For this card, I used the new Smiling Stamp set and Coordinating dies. I stamped the image and sentiment onto watercolor paper using waterproof black ink. I then colored it in with Peerless watercolors. I cut the whole panel out with the Nested Domes dies and added this to a top folded aqua card base. I added some Nuvo Crystal drops in gloss white to finish it up. This card uses the beautiful new Bouquet Building stamp set and Coordinating dies. For my background, I blended some purple distress ink onto Bristol Board card stock, and then sprinkled it with water. The flower was colored with Copic markers, cut out with the coordinating die, and mounted with foam tape. 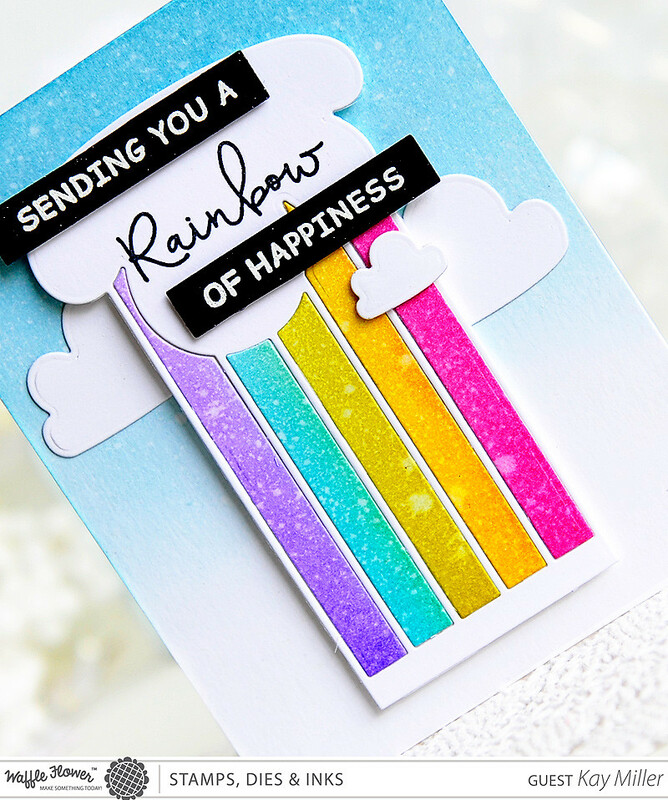 This fun card was created with the Rainbow Panel Die set and Rainbows sentiment set. For the background, I blended some distress ink and then sprinkled with water. For the rainbow, I did the same with several colors of distress inks and then used those to cut the pieces out to insert back into the rainbow. I cut out some extra clouds and added those with foam tape. The sentiment was heat embossed with white embossing powder on black card stock and added with foam tape. This cute stamp set is called Picture Perfect, and it's free with orders placed by 11:59pm ET on 4/9/18! For my card, I stamped the image with Memento Tuxedo black in and colored with Comic makers. I masked the image and blended a bit of Distress ink around the edges. To celebrate the blog hop, we are giving away $25 gift certificates to FIVE lucky winners. Leave a comment on my blog and along the hop by 11:59pm ET on 4/9/18 for a chances to win. Winners will be chosen at random from the comments left on any of the posts on this blog hop and will be announced on the Waffle Flower blog on 4/11/2018. To celebrate the new release and our 4th Birthday, all orders placed by 11:59pm ET on 4/9/18 will receive a free 3x4 Picture Perfect Stamp Set . No code required; Limited 1 per customer; While Supplies last. Next in line on the hop is the fabulous Kelly Latevola! Love the soft bear card. Anyone would love to open their mail to this cheerful card. these are gorgeous and I love the soft backgrounds! So many beautiful cards! I really like the bear one and the fabulous colouring of the flower on the third card! I love them all, your watercoloring is so free and pretty! As always your designs are so striking - love the cards! Love all your colorful cards - but that bear, he is my favorite! Cute cards, especially the first one! Picture perfect is my favorite. So adorable. 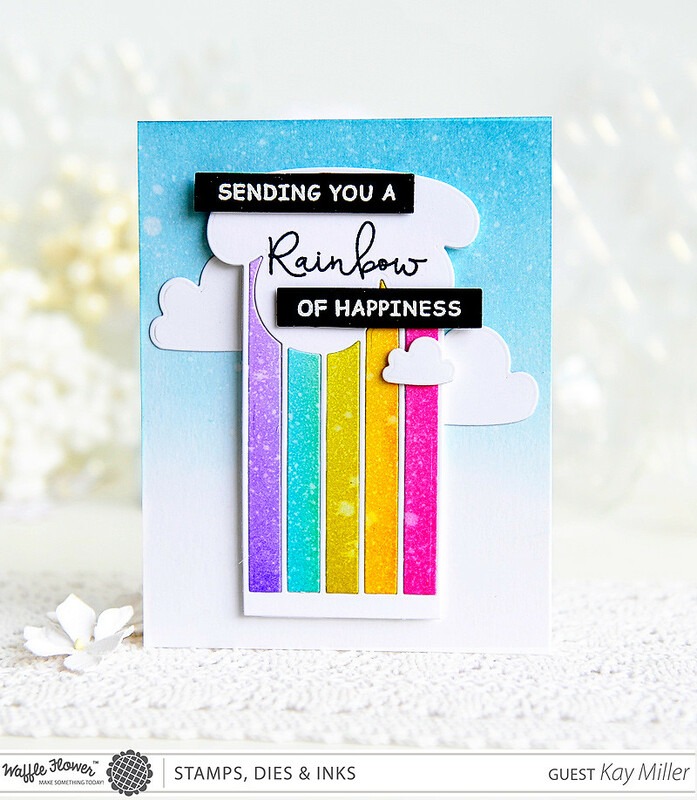 Love that rainbow die! Such sweet cards! Gorgeous cards! I love the kitty! Kay, once again I'm in awe of your amazing creativity! 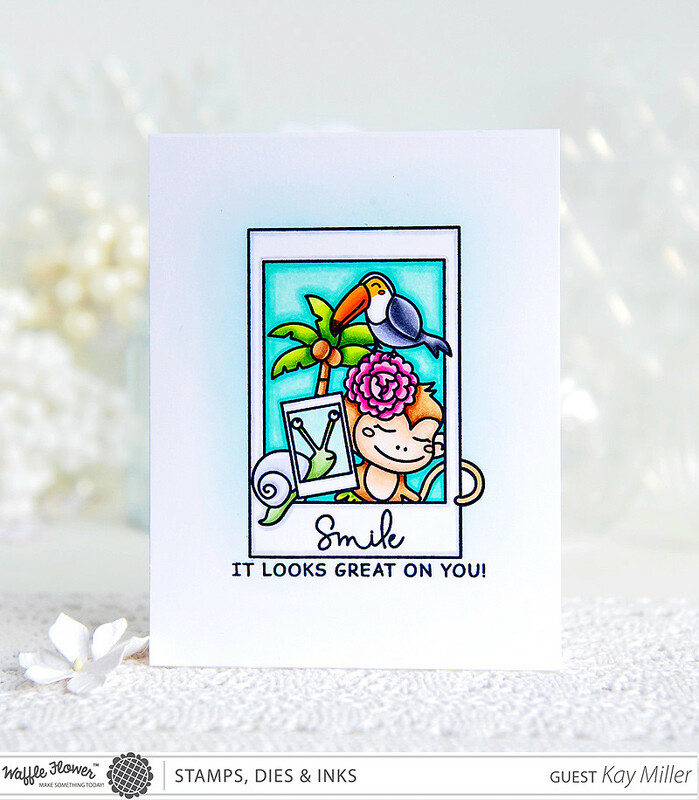 You've certainly done this new release proud in the gorgeous, smile-making cards you've designed! The bear...love, love and love! He's just way tooooo cute with his cookie and coffee! You've brightened this snow-falling, minus 20C day immensely! Oh my!!! Your cards are totally cute!!! Absolutely adorable cards, it’s impossible to pick a favorite. Thanks for sharing. I love our beautiful use of color. I tried to post on my ipad and it wouldn't let me. If this is a duplicate comment I apologize! Your cards are so beautiful. You did an awesome job on the cards. Thanks for sharing and have a wonderful week. Such beautiful, colorful cards. I love bright colors and your cards are an inspiration. Such wonderful artistry, your cards are amazing! Thanks for the wonderful inspiration! getting to be one of my favorite. cookie is darling. great cards. Beautiful coloring! Love the rainbow best, but all are wonderful! that bear card has such great texture! Omg I want to duplicate every card you made, so inspiring! extra luv the background with the purple flower. beautiful!! These cards are just so sweet, Kay! Love each one of them. So many gorgeous cards, love them all! I love that you created several cards using the new products from Waffle Flower. I especially like the Therefore I Am stamp set since I love making coffee related cards! Your cards are beautifully done. Your critter cards just make me smile! I think these new Waffle Flower critters are adorable! Such creativity! Wow! Thanks for the inspiring cards! Love all the new waffle flower sets! Love each one of your cards. Such wonderful colours. Such creative use of the items from this release! Your cards are so fun and fresh. I am new to Waffle Flowers and am loving everything! WOW! Lovely cards and they are all so different in style & techniques. Thank you for sharing. Cute critters always grab me and these are just so sweet. Love the watercoloring on your first card. Wonderful stamps, wonderful cards! I love your colors/coloring! Beautiful and super cute cards! All so wonderfully colored and executed. Wow so many beautiful cards. Thank you for inspiring. Amazing selection of cards - love your watercolor cards! They're all wonderful. I really like the animals. 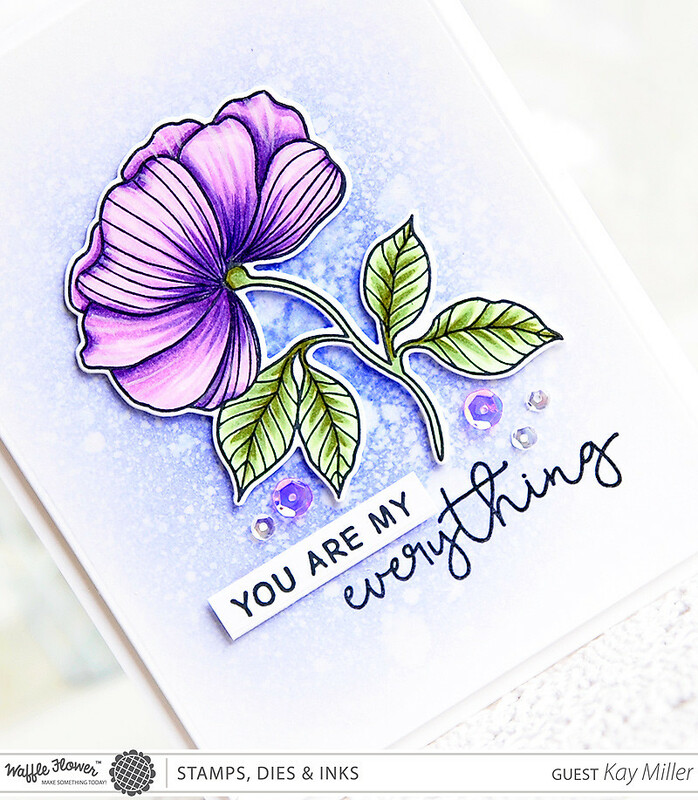 These cards are just beautiful with the pastel watercolor. Love, love the purple flower as it is my favorite color. But also the kitty is so adorable! Hi, Your cards are all super cute, I just love them!! Oh my !! This is such a magnificent set of cards !! Love all your amazing cards! The are just beautiful and fun! I love all the stamps and dies in this release - such a great variety! Thank you for all the great inspiration! Wow so many cards...love your work and just staring at them makes me happy! Oh your cards are AMAZING!!! I LOVE your beautiful painting and the way you design your cards. Thank you for sharing!! Oh my your cards are so incredibly beautiful and inspiring!! The first card with the bear is just stellar! I love the bear! Such nice coloring. I love the bear and kitty cards ! Watercolor makes them look so relaxing and playful. TFS. 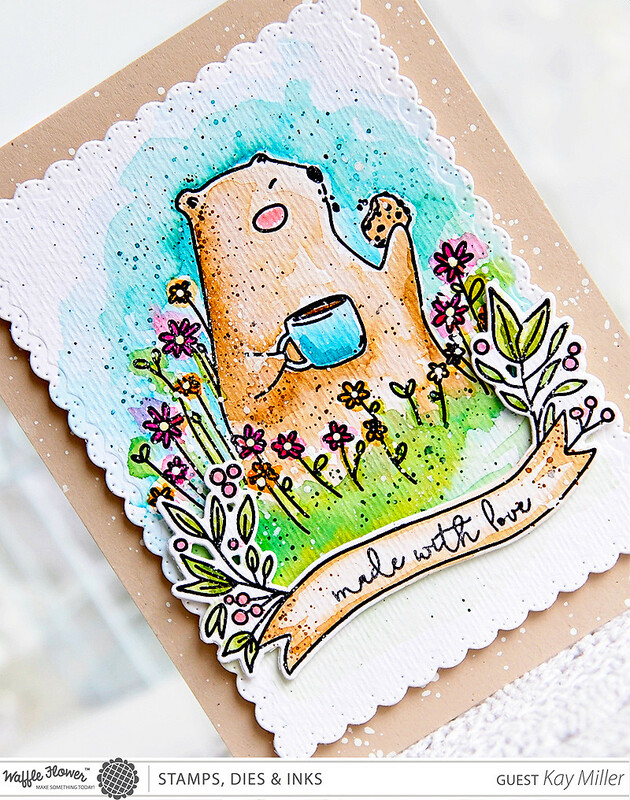 Such gorgeous cards - love the vibrant colors and the bear with his cookie is so cute. All the cards you made are simply outstanding. I don't know which I like the most! Great inspiration. Beautiful cards. I love the water coloring and the awesome rainbow colors. Awesome stamps and dies. Great cards--I love your kitty cat watercoloring--I am going to have to get this stamp set from Waffle flower--love their stamps! Wonderful cards! You really outdid yourself with all of them. They are AMAZING! I love the rainbow of colors in the Rainbow panel with the distress inks. All these adorable critters! I love them - thank you for your talent sharing! It's so hard to pick a favorite from your amazing cards! I really like all these unique new stamps. Your water colored images are just Charming! The monkey, snail photo card is cute as a button. Thank you! OUTSTANDING!! Love them all Kay!! Great cards and watercoloring! Thanks for sharing. What adorable cards. I love the cat and the mini scalloped panel. Cute cards - love the stamp!!!! 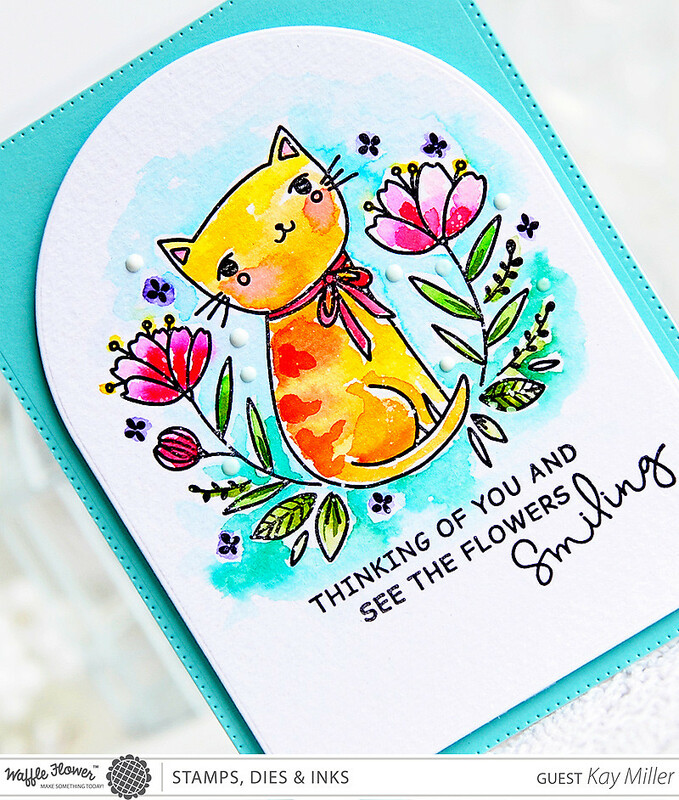 Fabulous cards with beautiful coloring! The cat and bear are favorites! Such great new stamps! Kay, you are one of my very favorite card artists! You simply amaze me with every lil piece of "card art" that you create! Love your beautiful cards. Thanks for the wonderful inspiration. I like your take on the rainbow. It's easier to mail but both are cute. Love the card with the cat! Holy smokes Kay, you have been one busy lady! These are all so amazing.Your cards are all fantastic. Awesome cards, so colorful and fun. Thanks for sharing your talents, what a great new release. Boy, you are such a busy girl!! And talented!!! 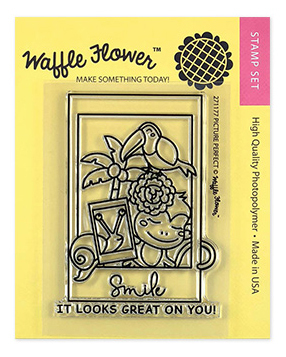 I love Waffle Flowers new releases and own some of their stamps and hoping to get more! Your talented and artistic creations are such beauties and am hoping to use them to inspire me to try different techniques!! Great cards today and love all of them! You sure made these stamps sets come alive with this set of cards! Love your choices for coloring! I am so excited that Waffle Flower (one of my favorites) is going to a smaller, monthly release! Thanks for sharing! My favorite is the cookie eating bear! But I Love all the cards! Wonderful cards! I love your coloring of these images, and you make me think I need ALL of these stamp sets! 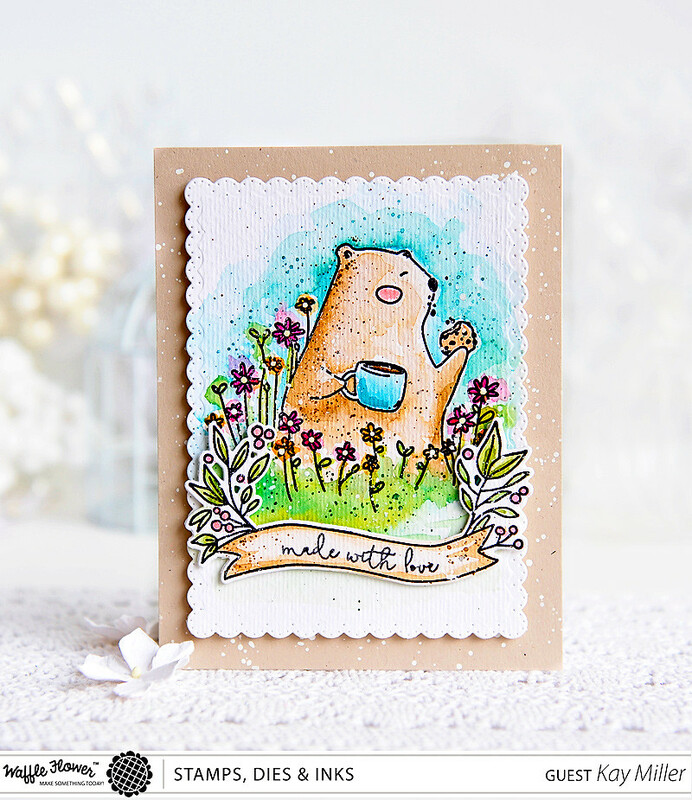 Your bear is adorable, Kay, & I'm in love with your bouquet builder card! The rainbow card blew me away! Such detail! Love them all! Each card is more charming than the next! Love your use of color! I think the Made with love may be my favorite - It would be perfect to send with cookies to my kids in college. Fantastic cards! They're all so wonderful, I can't even pick a favorite! I love the Bear and Bird sets! Such a cute whimsical look! Wonderful cards and new releases. I am in love with the sweet bear- you did a fabulous job with it. Wow--you have been busy. Love your coloring. Wow! What an amazing array of cards! I love how you used so many different techniques to give us an idea of all the different ways we can use these products. I particularly like the watercolored cards, especially the bear. I love all the texture you managed to get on there. Thanks so much for all the great inspiration! Wowww I love your "Therefore I Am" card - so gorgeous!! I already follow your blog because your watercoloring knocks me out, but you've outdone yourself on these adorable images! So much cuteness. That little bear has my heart, that's for sure! Thanks, Kay, for the great inspiration. The bouquet 💐 builder card is Fantastic! Really like the stunning colors. I also really like the way you have colored 4th a critter cards. Watercolors? They are adorable and finely detailed. Thank you for your inspiration! It should say how you colored all the critter cards. My user error on not spell checking first. Oh gosh I love them all. But that purple flower just spoke to me! Just so inspirational. Beautiful cards - thanks for sharing! Kay these are beautiful! That little cat is so sweet, but my favorite is the flower, I'm in love with that bloom! 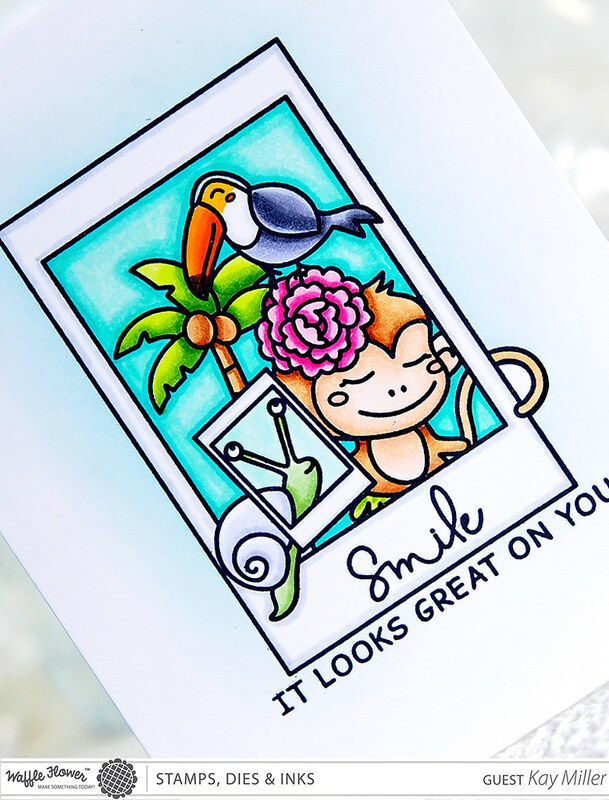 All your cards are so pretty........ love all these new stamp sets from Waffle Flower! 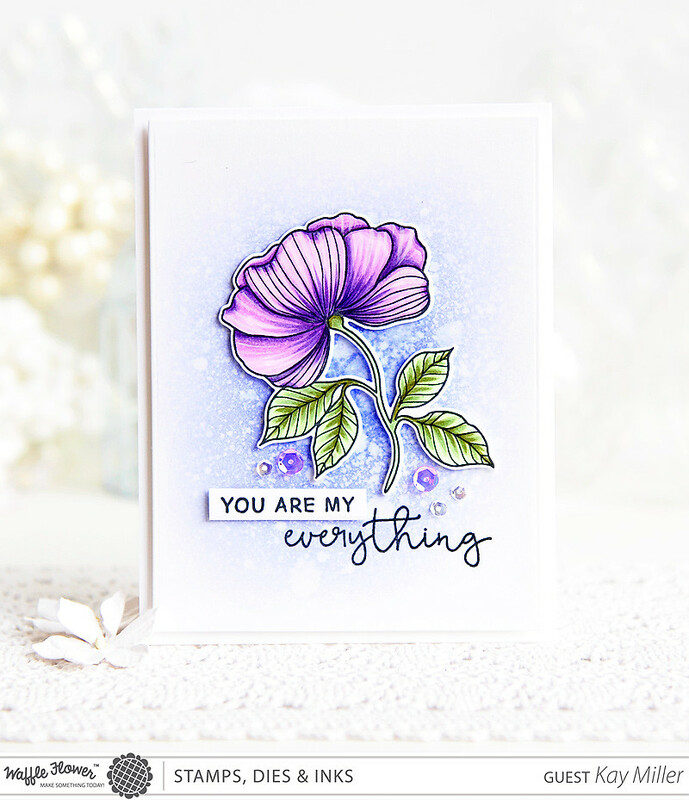 I love the textures on your first card - such a nice stamp set, but I absolutely love the bouquet builder release! All lovely cards! Kay you always add magic to every product your heart touches... each card a charmer, my friend! Such pretty cards!! The colors you used are so bright and fun. Thank you for sharing. Wonderful cards! I love your watercoloring, it's beautiful!